Garden Gem tomato: Why Harry Klee’s perfect cultivar isn’t sold in supermarkets. But supermarkets refuse to sell it. The Garden Gem, the perfect tomato. Tomato lovers, rejoice, for science has achieved the impossible: the perfect supermarket tomato. The Garden Gem won’t bruise during shipping, it resists many of the major diseases that regularly decimate tomato crops, and it is a flesh-producing powerhouse, turning out up to 22 pounds of tomatoes per plant, which is as productive as the best modern cultivars. But there is one aspect in which the Garden Gem is very different from every other supermarket tomato: flavor. It actually has it. Lots. More than 500 sensory panelists at the University of Florida have declared it among the very best tomatoes they have tested. When it comes to flavor, the tomato industry is broken. And not even the Garden Gem appears able to fix it. The story of the Garden Gem begins in 1989, when a scientist named Harry Klee was tasked by Monsanto to use GMO technology to produce a slow-ripening tomato. The hope was that if tomatoes could be picked almost ripe, instead of green, they would be luscious and delicious by the time they made it to store shelves. The experiment was a resounding success—Klee’s GMO tomato took three times longer to ripen. But it was an even bigger failure, because the slow-ripening tomato didn’t taste a whole lot better than most supermarket tomatoes. It turned out a tomato’s flavor problem went much deeper than simply being picked green. And so, in 1995, Klee joined the horticultural science department at the University of Florida to dedicate himself to cracking the mystery of tomato greatness. Over the next 20 years, he would grow more than 400 varieties of heirloom tomatoes and have them rated by hundreds of sensory panelists, who answered a 63-question survey designed by Klee’s colleague Linda Bartoshuk, the psychophysicist best known for her discovery of supertasters. The questionnaire posed standard queries about sweetness, sourness, and flavor intensity, rated on a scale from 1 to 9. But it also asked panelists to rate “the strongest liking of any kind you’ve experienced,” “the most intense annoyance you’ve ever experienced,” and “the most amused you have ever been by an anecdote.” By relating the tomato scores to these unrelated benchmark experiences of pleasure and dislike, Bartoshuk was able to generate tomato ratings that could be compared across different years. Klee, meanwhile, analyzed the tomatoes in a gas chromatograph—a machine capable of measuring minute quantities of flavor compounds. Klee hoped that by scrutinizing the flavor chemistry of the best-tasting tomatoes, he could figure out which compounds made tomatoes delicious. Klee may have learned more about humans than tomatoes. In 2005, he and cell physiologist Steve Goff discovered that the flavors people most love in tomatoes are all synthesized from important nutrients, such as essential amino acids, carotenoids, and omega-3 fats—suggesting a deep and as yet misunderstood relationship between flavor and nutrition. 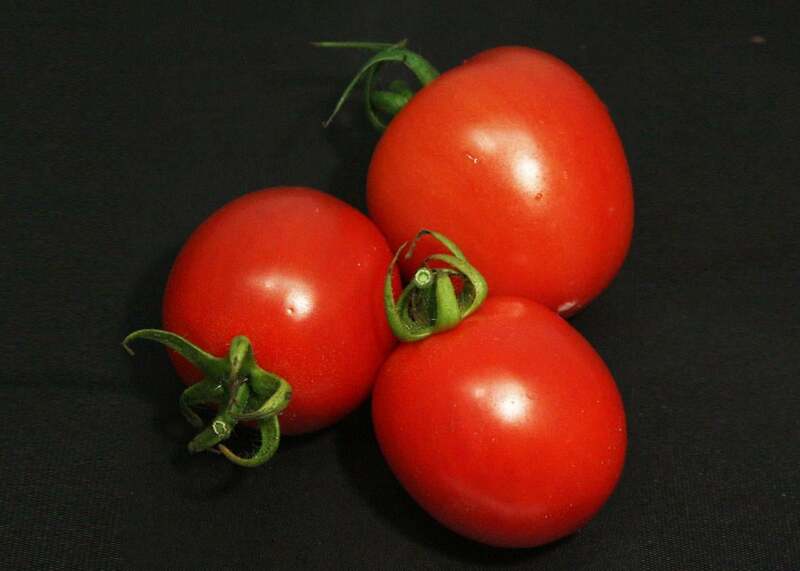 More recently, Klee and Bartoshuk learned that these nutrient-indicating flavor compounds can make tomatoes taste sweet independent of sugar content. But Klee’s most important accomplishment may well be a tomato he first plucked in the early months of 2011. To create it, Klee took the best-tasting tomato he’d ever grown—the Maglia Rosa, a grape tomato that tastes extraordinary but, like so many heirlooms, is very hard to grow—and crossed it with a commercial powerhouse called Fla. 8059, which grows superbly but tastes like tap water. He was aiming for a compromise—a tomato that grew well and tasted good. What he got shocked him. Like its commercial parent, Klee’s new tomato boasted excellent shelf life, disease resistance, and productivity. But by some miracle, it tasted so good that its flavor scores were statistically identical to its heirloom parent. Klee dubbed his miracle fruit the Garden Gem. The rest of the story, you would think, would go something like this: Supermarkets clamor for exclusive rights to sell the Garden Gem. Growers from Florida to California to New Jersey engage in a historic bidding war for Garden Gem seeds. And consumers at last experience the fantasy of walking into a supermarket and buying tomatoes that cause tears of joy to slide down their cheeks as the juice slides down their chins. Here’s what actually happened: Klee offered the tomato to commercial seed companies. They said no thanks. There has been, according to Klee, “zero interest” in the Garden Gem. It seems almost impossible to believe. All tomatoes are grown with a single destination in mind: the human mouth. All those mouths are connected to tongues and noses that send flavor signals to the brain and light up pleasure centers. How strange that the industry that produces tomatoes doesn’t care about flavor. But it doesn’t. And the major players have as much as said so. Klee remembers attending an industry conference about flavor where one of California’s largest commercial tomato growers kicked off the proceedings by announcing that he had never lost a single sale because his tomatoes didn’t taste good. When new tomato varieties are developed, the field trials measure every imaginable trait: yield, fruit uniformity, appearance, shelf life, shippability, pounds per plant, even whether a tomato plucks clean or is left with tiny piece of stem attached. But not flavor. Recently, an industrial grower told Klee what he sees as the Garden Gem’s flaw: It’s a bit small—about 50 grams. (Some very large tomatoes reach a weight of 250 grams.) A small tomato entails incrementally higher labor costs, because it requires a few more plucks per pound. However legitimate this may sound, it is, in fact, more evidence of what appears to be incomprehensible dysfunction in the tomato market. For one thing, there is a booming business in cherry and grape tomatoes, which are a fraction of the size of Garden Gems (and require many more plucks per pound). And consumers, Klee points out, don’t even like the extra-large tomatoes industry is so fond of. “Most people just don’t know what to do with a huge tomato,” he says. Every other market, from cars and wine to smartphones and spas, has an age-old method for recovering the added cost of producing a high-quality product: charge a higher price. Tomato growers are open to growing better-tasting varieties in principle, but only if they get paid more for it. Supermarkets, on the other hand, insist that shoppers only care about price. And can you blame them? After decades of eating tomatoes that taste like wet paper towels, no one thinks tomatoes are worth much. The entire supply chain seems caught in an endlessly descending cycle of blandness, like some demented Escher illustration. This problem afflicts the entire produce aisle. Jack Pandol is a third-generation grape grower from Bakersfield, California, who grows several varieties of grapes bred for better flavor. Pandol has had retailers tell him point blank that his grapes taste incredible but no, they won’t pay him more than what they’d pay for regular grapes. Klee was recently in New Zealand, where he tasted new varieties of kiwis whose superb flavor floored him. None of them will make it to North America, the kiwi growers told him, because there’s no market for better kiwis. They’ll sell them in Europe and Asia, where flavor is worth something. Yet there is reason to be hopeful. Once upon a time, don’t forget, all computers were beige, and craft beers makers were so small people called them microbreweries. Commoditized markets, however bland, can very quickly turn into markets that reward innovation and quality. So perhaps the better question to ask is: Will industrial agriculture ever move beyond beige? Klee is optimistic. He points out that even where he lives, on the outskirts of Gainesville, Florida, he is within walking distance of a pub that serves 80 types of beer. Klee is breeding what he hopes will be the Samuel Adams of tomatoes—a gateway tomato that will wake growers, supermarkets, and consumers to the wonders of flavor. Last year, Klee crossed Fla. 8059 with another superb-tasting heirloom. (He won’t reveal which one just yet.) The resulting hybrid, Klee says, tastes fabulous, is even more productive than the Garden Gem, and delivers a larger-sized fruit the industry will love. If this tomato passes field trials—so far, the results are promising—then Big Tomato will have no reason to say no. There’s even hope for the Garden Gem. Klee did receive one extremely enthusiastic response from a seed company—in Italy. “They loved it,” he says. “They asked for 10,000 more seeds.” One day soon, it may well be possible to walk into your local supermarket and buy a basket of Garden Gems. You’ll just have to move to Rome.